James Herbert Warner was born in 1914 in the small Lincolnshire town of Horncastle. This is in the heart of the area which would become the home of many Second World War airfields, and not far from the village of Hameringham where George “Johnny” Johnson was born seven years later. He joined the RAF in 1940 and although initially selected for pilot training was eventually transferred to the observer scheme, from which he qualified in September 1942. He received a commission on completing his training. By December 1942, he was undergoing the final phase of heavy bomber training at 1654 Conversion Unit, and was crewed up with Vernon Byers and the rest of his crew. They all moved together to 467 Squadron on 5 February 1943. Their first operation was “Gardening” in the Silverthorne area on 9 March, and they would undertake just two further operations before transferring to 617 Squadron on 24 March. 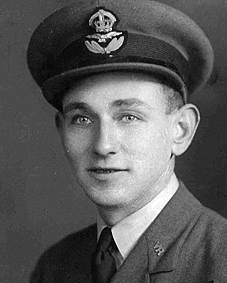 As a Flying Officer, James Warner was the senior member of the Byers crew by rank. Byers himself was recommended for a commission on 17 April, and bomb aimer Neville Whitaker also received one posthumously. All seven of the crew were lost when a lucky shot fired from behind brought down AJ-K just after it had crossed the island of Texel on the Dutch coast. Along with five of his colleagues, James Warner’s body was never found and he is commemorated on the Runnymede Memorial. I was wondering if you have any information on the navigator Harold Sydney Hobday? Especially pictures, he is my granddad and he was a navigator in the dambusters, But i do not have a lot of information or pictures of him so i was wondering if you could help me. I have some other material about him, which I will send you by email.